It’s funny how sometimes you seem to be making giant strides and things are falling into place all around you, and other times every tiny step (or stitch…) seems like a huge effort and then you stop altogether for a while. June has been one of those latter times for me, and this is all I’ve done, creatively speaking, since last time I blogged. I love these effects (and of course I immediately want to dye them!). But I need to go much further and, for that, time must be set aside and guarded. Well, I wrote this to motivate myself and for a bit of accountability so I’m heading off to my workroom now, but before I go, a shout out to any members of the UK Embroiderers’ Guild who read this. Members have set up a web ring and a Flickr group to share work and celebrate being part of the Guild. Please join in and spread the word in your branch and region :-). great little steps here. love it. We all have slow times and I think we creative folk need it too. It’s hard to just sit with it sometimes but I think in the long run It benefits my work when I have pauses. Be kind to you’re self! 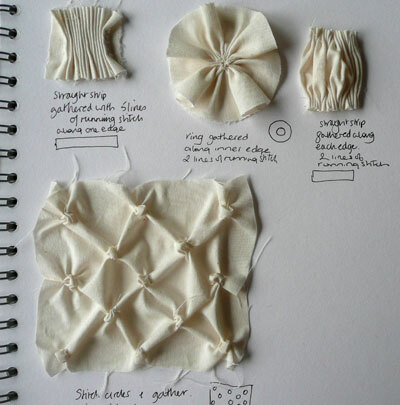 I was just about to suggset “the Art of Manipulating fabric” but now I see it on your reading list! I hope you don’t mind that I used a paragraph from your blog on mine to advertise the Ring and Flickr groups? you have a really lovely blog! I’m so glad that I came across it 🙂 best wishes on finishing your project! and yes, i dyed my scarf twice. Good to see you back with some interesting samples. Thanks for the link to the EG flickr site – I’m not a member as I’m not an embroiderer but great to see the variety of work. 🙂 I was just reading The Art of Manipulating Fabric and thought about your samples on Flickr. Very nice and maybe a beginning of something bigger.? Thank you for your kind comment, I should have had these pieces to play with as well. I particularly like the gathered ring.